Having to get a job. If I was independently wealthy I wouldn’t have had to have gone to a job interview the day before yesterday but, things being as they are, I did have to go to a job interview the day before yesterday. Anyway, after the interview I went off to meet my pal Craig for one of our, now pretty regular, weekly wanders. After doing a few others things, we ended up at the Museum of London. This is always a great place to pop in, see what’s new and have another little look at familiar things, and there’s currently a really good free exhibition of images of blitz-damaged London (http://www.museumoflondon.org.uk/museum-london/whats-on/exhibitions/perspectives-of-destruction). In the space dedicated to ‘Looking for Londoners’, there is also a free display of Roman hand tools, excavated from various sites along the Walbrook Valley, which I was very keen to get a look at. The Walbrook, one of London’s famous ‘Lost Rivers’ cut a north-south slash through London from Finsbury Circus to Canon Street and along its banks were workshops of all kinds. Leatherworkers, metalworkers, coopers, jewellers, carpenters and more all set up shop along the Walbrook and archaeologists excavating sites along its course have found the lost and discarded remnants of their trades. 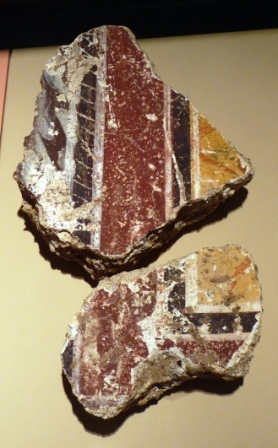 One thing to flag up straight away: check out the condition of these artefacts! Some of them are pristine. This superb preservation is the result of the waterlogged conditions of the sites. The thick wet mud lacks a crucial ingredient for decay and rust; air, so these anaerobic conditions slow down the normal processes by which objects deteriorate and, often, entirely disintegrate. Sometimes tools feature text; stamps giving a maker’s name as a form of advertising, stamps marking goods made by or for the Roman state, owner’s name, and so on. 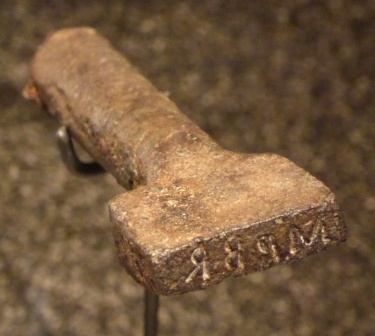 The stamp above is inscribed, in reverse, with ‘MPBR’, which has been interpreted as an abbreviation of Metalla Provinciae Britanniae: ‘the mines of the province of Britannia’, so may have been an official stamp to mark ingots of metal. These two tools, a bradawl found at Moorgate Street and a chisel found at Bucklersbury House, have marks stamped into them. 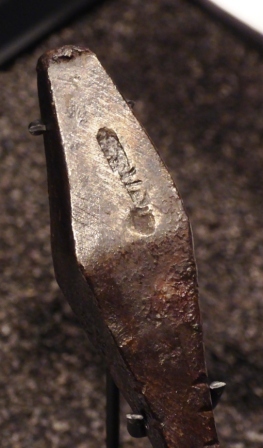 The chisel has been stamped with ‘MARTIA(L)’. Possibly the maker’s name. The, possible, maker’s mark on the bradawl hasn’t been punched very clearly and is illegible. 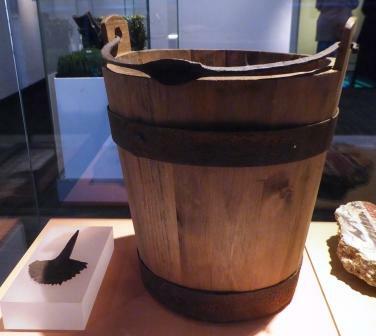 Nevertheless, in these tools we see evidence of two layers of London’s industrial life. The stamps represent evidence for those making the tools, either locally or further afield, that other workers then used to make products for Londoners. As well as the tools, there are are a few pieces of the products being made. This scrap of cut and printed (or maybe stencilled?) 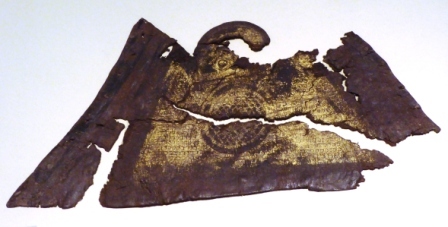 leather, found at Lower Thames Street, is the vamp of a slipper (the front and centre part of a shoe’s upper), decorated with a gilded design. I was trying to work out what kind of shoe it might have been and it looks like it might have been part of a toe-post sandal, with the post held in place by the hoop at the top. The display also contains a really unusual tool. It’s unusual to find the wooden elements of barrels and buckets as, unless they are found in anaerobic conditions (they’re sometimes found in wells), these organic elements just rot away and disappear. This croze is clear evidence for the coopers who made the buckets and barrels needed in London, and the specialist tools used. Lastly, there is this lovely, near complete pot from St Thomas St. Southwark. 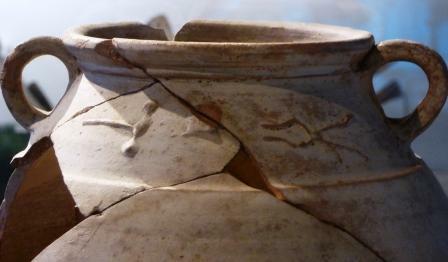 A close look at the neck of the pot reveals these details. The pot is decorated with tools of a trade; a smith’s hammer, anvil and tongs. 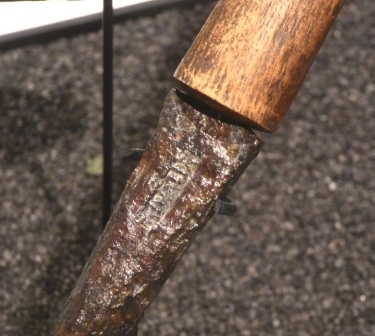 The pot was found at the bottom of a timber-lined well and it’s not unusual to find objects deposited in wells as part of a ritual closure deposit. Perhaps the well belonged to the smithy and was ritually closed down when the smithy ceased trading, with an offering of thanks to the god Vulcan. There are lots of other tools in the display. This is just a small selection. 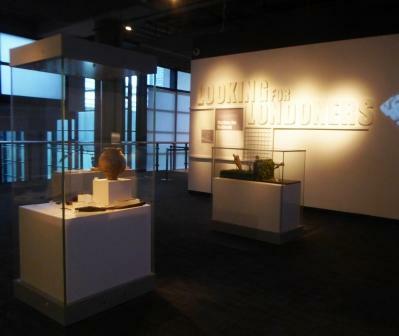 The Museum of London is free to visit so do go along and have a look. 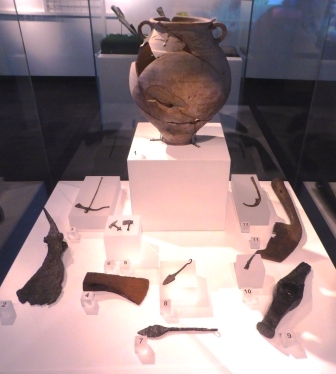 This display was curated by Owen Humphreys (@Roman_Tools), PhD student, Museum of London & University of Reading. 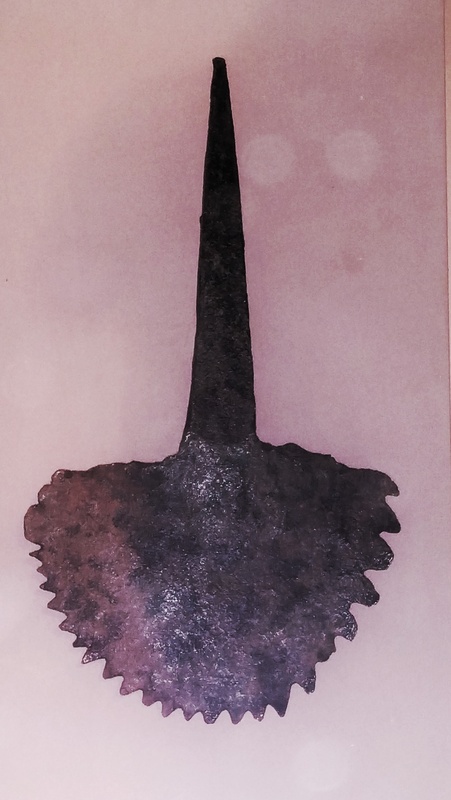 *UPDATE: Someone I used to work with just read his blog and then messaged me to say hat her Dad had one of those crozes, which his Dad, a blacksmith, had given him some time in the 1940s. 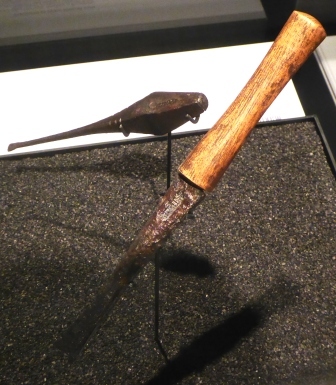 Hand tools really haven’t changed in millennia. 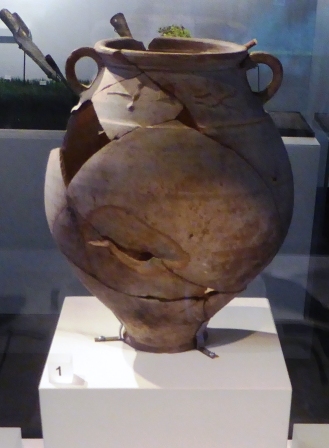 This entry was posted in Archaeology, London, Roman Britain, Romans, Uncategorized and tagged jobs, London, Museum of London, Museum of London Archaeology, Roman, Thames, tools, Walbrook. Bookmark the permalink. ← Let there be light.